HOUSTON – (March 21, 2018) – A polymer mat developed at Rice University has the ability to fish biologically harmful contaminants from water through a strategy known as "bait, hook and destroy." Tests with wastewater showed the mat can efficiently remove targeted pollutants, in this case a pair of biologically harmful endocrine disruptors, using a fraction of the energy required by other technology. The technique can also be used to treat drinking water. The mat was developed by scientists with the Rice-led Nanotechnology-Enabled Water Treatment (NEWT) Center. The research is available online in the American Chemical Society journal Environmental Science and Technology. The mat depends on the ability of a common material, titanium dioxide, to capture pollutants and, upon exposure to light, degrade them through oxidation into harmless byproducts. Titanium dioxide is already used in some wastewater treatment systems. It is usually turned into a slurry, combined with wastewater and exposed to ultraviolet light to destroy contaminants. The slurry must then be filtered from the water. The NEWT mat simplifies the process. The mat is made of spun polyvinyl fibers. The researchers made it highly porous by adding small plastic beads that were later dissolved with chemicals. The pores offer plenty of surface area for titanium oxide particles to inhabit and await their prey. The mat's hydrophobic (water-avoiding) fibers naturally attract hydrophobic contaminants like the endocrine disruptors used in the tests. Once bound to the mat, exposure to light activates the photocatalytic titanium dioxide, which produces reactive oxygen species (ROS) that destroy the contaminants. Established by the National Science Foundation in 2015, NEWT is a national research center that aims to develop compact, mobile, off-grid water-treatment systems that can provide clean water to millions of people who lack it and make U.S. energy production more sustainable and cost-effective. NEWT researchers said their mat can be cleaned and reused, scaled to any size, and its chemistry can be tuned for various pollutants. "Current photocatalytic treatment suffers from two limitations," said Rice environmental engineer and NEWT Center Director Pedro Alvarez. "One is inefficiency because the oxidants produced are scavenged by things that are much more abundant than the target pollutant, so they don't destroy the pollutant. "Second, it costs a lot of money to retain and separate slurry photocatalysts and prevent them from leaking into the treated water," he said. "In some cases, the energy cost of filtering that slurry is more than what's needed to power the UV lights. "We solved both limitations by immobilizing the catalyst to make it very easy to reuse and retain," Alvarez said. "We don't allow it to leach out of the mat and impact the water." Alvarez said the porous polymer mat plays an important role because it attracts the target pollutants. "That's the bait and hook," he said. "Then the photocatalyst destroys the pollutant by producing hydroxyl radicals." 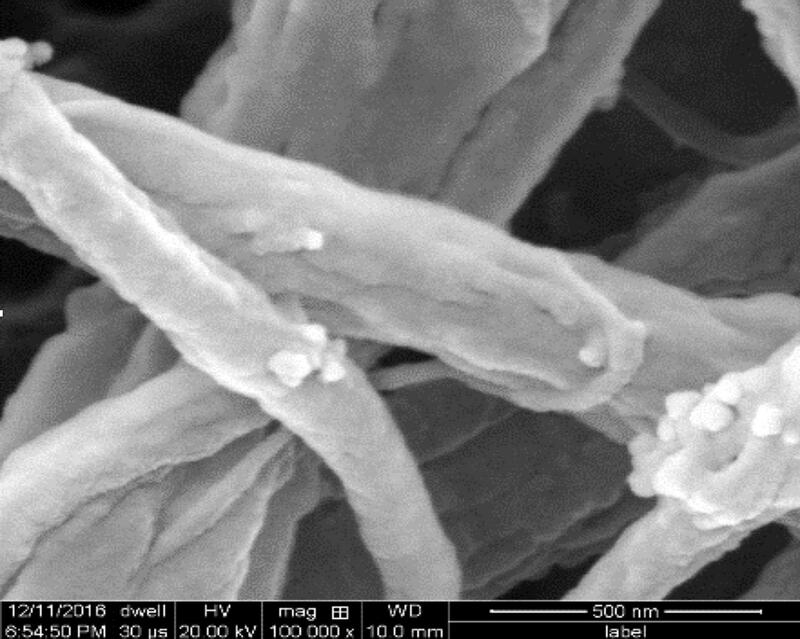 "The nanoscale pores are introduced by dissolving a sacrificial polymer on the electrospun fibers," lead author and former Rice postdoctoral researcher Chang-Gu Lee said. "The pores enhance the contaminants' access to titanium dioxide." The experiments showed dramatic energy reduction compared to wastewater treatment using slurry. "Not only do we destroy the pollutants faster, but we also significantly decrease our electrical energy per order of reaction," Alvarez said. "This is a measure of how much energy you need to remove one order of magnitude of the pollutant, how many kilowatt hours you need to remove 90 percent or 99 percent or 99.9 percent. "We show that for the slurry, as you move from treating distilled water to wastewater treatment plant effluent, the amount of energy required increases 11-fold. But when you do this with our immobilized bait-and-hook photocatalyst, the comparable increase is only two-fold. It's a significant savings." The mat also would allow treatment plants to perform pollutant removal and destruction in two discrete steps, which isn't possible with the slurry, Alvarez said. "It can be desirable to do that if the water is murky and light penetration is a challenge. You can fish out the contaminants adsorbed by the mat and transfer it to another reactor with clearer water. There, you can destroy the pollutants, clean out the mat and then return it so it can fish for more." Tuning the mat would involve changing its hydrophobic or hydrophilic properties to match target pollutants. "That way you could treat more water with a smaller reactor that is more selective, and therefore miniaturize these reactors and reduce their carbon footprints," he said. "It's an opportunity not only to reduce energy requirements, but also space requirements for photocatalytic water treatment." Alvarez said collaboration by NEWT's research partners helped the project come together in a matter of months. "NEWT allowed us to do something that separately would have been very difficult to accomplish in this short amount of time," he said. "I think the mat will significantly enhance the menu from which we select solutions to our water purification challenges," Alvarez said. Co-authors are graduate students Hassan Javed and Danning Zhang of Rice; Jae-Hong Kim, a professor and chair of chemical and environmental engineering at Yale University; Paul Westerhoff, vice dean for research and innovation in the Ira A. Fulton Schools of Engineering at Arizona State University, and Qilin Li, a professor of civil and environmental engineering and of materials science and nanoengineering at Rice. Lee is an assistant professor of environmental and safety engineering at Ajou University, South Korea. Alvarez is the George R. Brown Professor of Materials Science and NanoEngineering and a professor of civil and environmental engineering at Rice.